moving to Germany stuff is serious business. I miss my couch, didn't know that was possible, but I do. I miss a fresh cup of coffee after dinner and reading blogs while Jude naps, and I miss driving my car and going to Target on Sundays. Basically, I miss my life. I know I'll adjust and I'm trying not to let this homesickness get me down. Well...to add to this list of gripes that I cannot get into a book is just downright brutal. But I don't blame the move so much for that. No, I blame the last book that I read...I think it's ruined me. So, that's what today's book chat topic is. 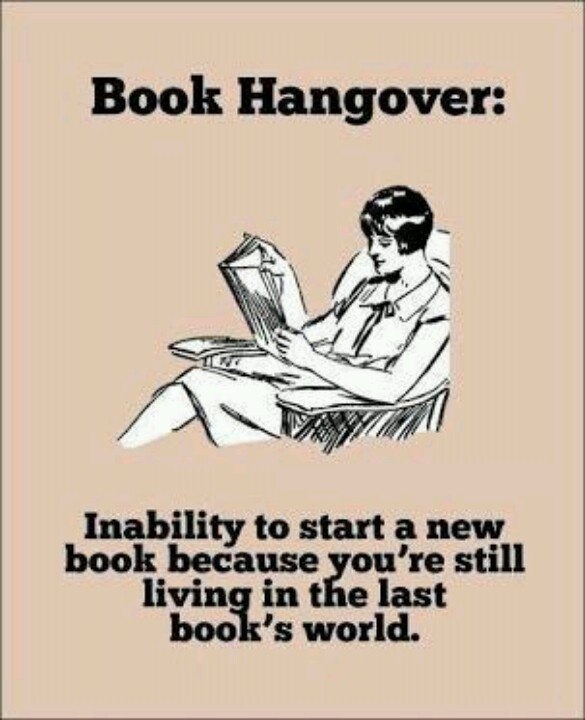 Book hangovers. Books that capture you so intensely that you can't recover so easily. Books that keep a hold on your heart long after you're done turning it's pages. In general, I hate starting a book. I despise that transition between books. Your mind is still on that last story and it's so hard to just commit to a totally new one. When the book you just finished was a special one, it makes the transition even harder...or even impossible. For me, right now, I'm recovering from this book. I think part of the hangover is due to the slightly abrupt and unreconciled ending. Every time I try to read a new story, I struggle with this inner voice that keeps saying, "who cares! What about Daniel and Lucy?" It's a little harsh to the potentially great stories I keep trying to read, but I can't help it. I'm too numb. I've been desensitized by the awesomeness of the last book. My fiction-loving heart needs time to heal. There should be meetings in a church basement for things like this. Has this happened to you? How do you cope? *For the record: I am 80% done with this book which has been enjoyable without requiring too much emotionally from me. I have learned not to expect two earth-shattering books in a row; therefore, I choose my following reads accordingly. I hope you link up with us. I should point out that today's co-host is Ashley of This Unscripted Life. It's entirely appropriate because I bet she's suffering a hangover from the same book that I am. Please go give her a consoling hug. It's tough. I know how you feel! I just finished Game of Thrones, finally, and now it's all I can think about as I read this new book. I'm finally joining up with your book chat! I see that you're working on Divergent - it's one of the ones I wrote about! I loved this topic! I've been wanting to read My Name is Memory but I know I'm not even emotionally read it. I find that when I have a lot going on in my personal life I have to balance out my reading world with something opposite otherwise I'm a right mess. I'm sorry the move has been tough so far. Our move to Italy was really hard on me. We lived in a hotel for almost 2 months, moved into a house off base, discovered it had mold, and then decided to move on base. It took a long time for me to feel settled. In Germany we were constantly on the go. We were always OUT doing something. It was harder to do that in Italy. There were so many places we weren't allowed to go. I know you'll feel much better once you have your couch =) Being surrounded by YOUR things brings a nice sense of comfort. We both know you'll still have homesick moments but life will catch up to you, you'll be busier, and you'll have less time to feel homesick. I hope that you make great friends to help you along the way because that always helps! Oh I'm sad I missed this book chat! My last big book hangover was Graceling. You really got me on that one!